Liverpool centre-back Dejan Lovren has signed a new long-term contract at the club until 2021. The 27-year-old moved to Anfield from Southampton in a deal worth £20m in 2014 and his current contract was due to expire next year. 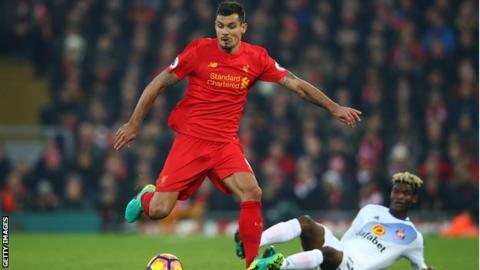 Croatia defender Lovren struggled for form in his first season but has made 105 appearances in total for Liverpool, scoring four goals. "I think I am the happiest guy [in the world] today," he said. "It was always my dream to stay as long as possible at one club that I love - and that is Liverpool," he added. Lovren has played 28 games this season, scoring twice. He struggled to reproduce the form he showed for Southampton following his move and faced criticism in his first term at Anfield. But he has now established himself under manager Jurgen Klopp and formed part of Liverpool's first-choice centre-back pairing alongside Joel Matip this season. Speaking to Liverpoolfc.com, he added: "After all that happened in the beginning, in the past two seasons, I think I've done better than in the first season. The club have rewarded me, they believed in me and also the fans."